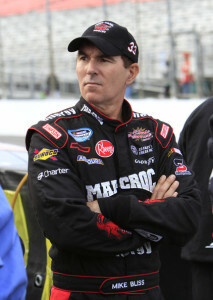 Mike Bliss marked his first major victory in 1993 when he captured the USAC Silver Crown National Championship. In 1995 he had several notable performances and victories, including finishing within the top 10 in the NASCAR Craftsman Truck Series. He went on to win the championship in the Craftsman Truck Series in 2002. In 2003 Bliss entered the NASCAR Busch Series and ended the season in 10th place. The next year he would score his first victory in the series, while finishing 5th in points.